Adrenaline Rush is a challenge course that is as versatile as they come. Composed of three main sections each with its own series of challenges, that can be used individually or connected as one large unit. Used in multiple combinations or individually you can create the perfect challenge course your specific situation. The complete Adrenaline Rush course is made up of 3 sections. (Left, Right, Center). 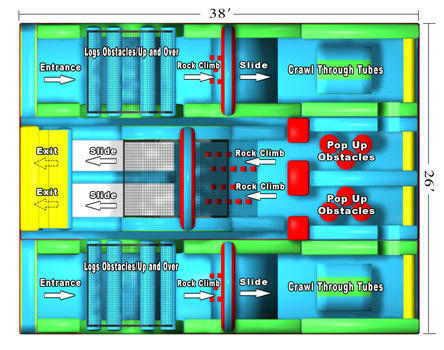 The diagram to the left shows the course path and obstacle challenges. Unknown. "I will absolutely recommend Bounce Orlando to everyone. If you wanna have fun, you need to call them! Every single person at my party loved it!"